Monarch, designed by industry veteran Dr. Mary Flanagan, along with Zara Downs and Max Seidman, is a game of nuanced uniqueness. A light-weight tableau-builder for 2-4 players (the 2 player game is an officially-endorsed variant), it features fantastic artwork from Kate Adams, Sarah Ettinger, and Zara Downs, as well as one of the most interesting takes on engine-building I’ve seen in a game yet. Thematically, Monarch is a tale of sisters, princesses of Minervia, where your mother the Queen is coming to the final days of her rule. She has tasked each of you to prove that you are the best suited to assume her throne, a quest accomplished by gathering the most influential court, assembling the royal regalia and menagerie, and embodying the precepts of Bounty, Culture, Might, Wisdom, and Balance. To the princess who proves herself most worthy will go the crown! Minervia, as it begins the game. A would-be ruler would do well to treat this land with kindness and respect…and maybe get some bigger farms or something. At its core, Monarch is a very straightforward game. Each player is trying to amass the greatest total of Crowns (points) before the endgame is triggered. 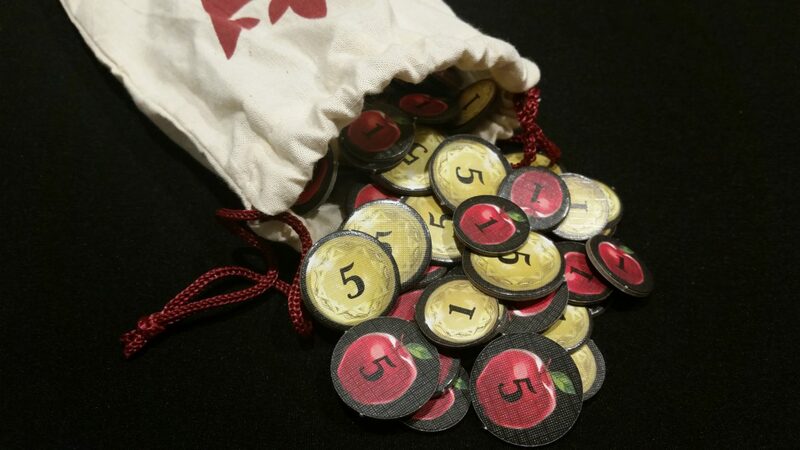 They will do this by adding cards to their tableau (their court), purchased with the game’s two currencies, food and coin. With each card added, they gain new scoring opportunities; every card belongs to one of the aforementioned virtues (Bounty, Culture, Might, Wisdom, Balance), and many of them create powerful scoring synergies between them. 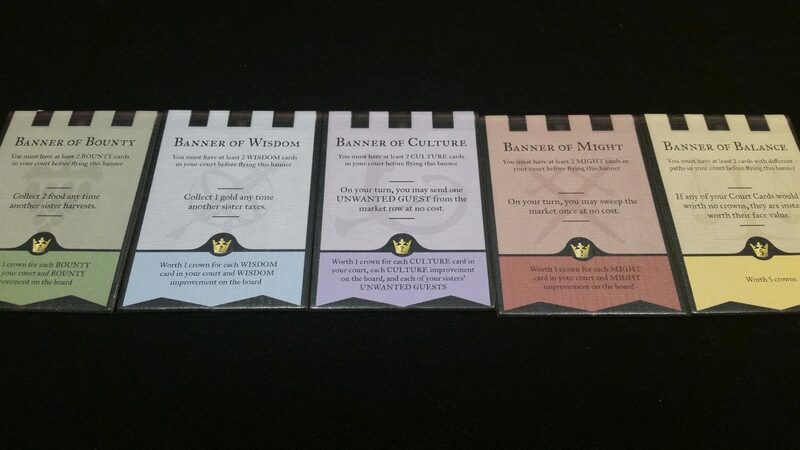 Furthermore, by acquiring cards from the same virtue, each sister can fly one ‘banner’; these banners grant powerful ongoing abilities as well as more endgame scoring mechanisms. The Banner Virtues of the kingdom. Each one is valuable, but you can only fly a single one per game. Andrew: Of course, not all court members are useful or positive – the only particularly aggressive move in Monarch is to spend some coin or food to send an unwelcome guest over to an opponent’s court. These brash layabouts will do nothing but cost points at the end of the game, but the rules of hospitality make them a challenge to move along. That’s when you send in the Bards. The tableau building in Monarch is interesting enough, if straightforward. Tactical decisions are fairly minimal – you will generally go for the best card available that you can afford, looking to create synergies and avoid the tenancy for one card to nullify others (like the Harpists & Floutists, who feel uncomfortable if there are any military around, or the Tart Cart which will hilariously and inexplicably make Monkeys on Ostriches somehow less fascinating). These decisions are straightforward but satisfying, and it’s fun to see your court come together as you add cards to your tableau. Jess: But our favorite part of Monarch, and the thing that makes it really unique and interesting, is the kingdom of Minervia itself. See, Monarch is a tableau building game, but the economic engine which drives it is the kingdom, represented by 9 tiles at the center of the board. 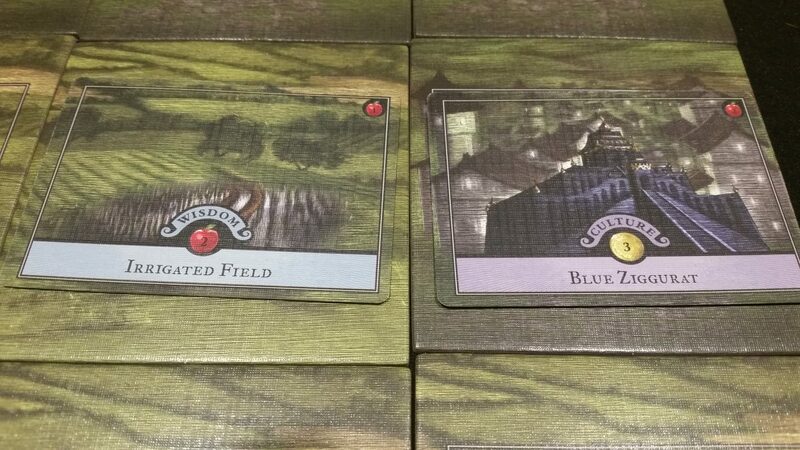 These tiles are either simple villages, which produce a single gold coin, or farms, which produce food. 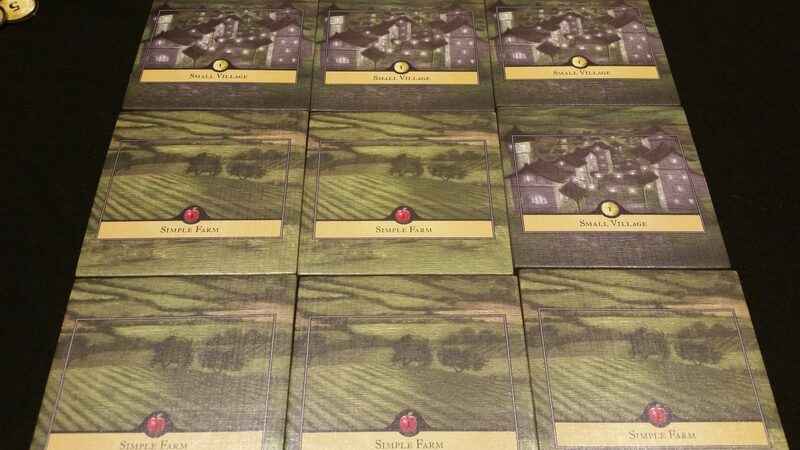 At the beginning of each player’s turn, they will either Harvest, gaining food from each farm, or they will tax, gaining gold from each village (but only once they provide each village with food – the responsibilities of the ruling class). By upgrading the basic farms and villages, the productivity of the kingdom increases dramatically. Now, a clever princess will see that these benefits will increase her ability to bring expensive, valuable cards into her court. However, the fact is that what strengthens the kingdom for one sister strengthens it for all of them. Andrew: That means the improvements you put in place aren’t just yours – everyone‘s capacity to produce increases. And that makes things really interesting. Suddenly, you need to balance the desire to improve production lines with the reality that you are strengthening not only your own position, but everyone’s. It creates a truly interesting table dynamic – if everyone commits to improving the kingdom, production goes up dramatically and big plays become possible. If everyone is stingy, then the game will crawl as players scrape to get enough coin and food together to buy cards. 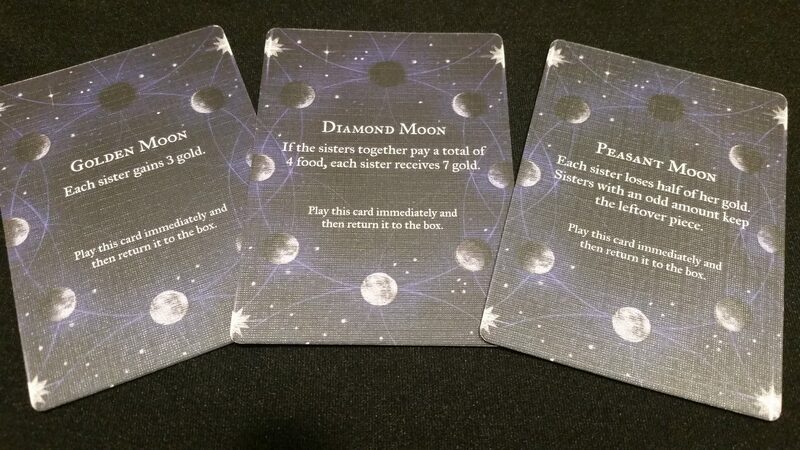 Improvement cards aren’t the only thing which demand cooperation – the Moon cards, drawn randomly and triggering immediately, will either bring weal or woe, but will often call for the sisters to act as one for maximum benefit. Andrew: Is it perfectly balanced? Well, maybe not; in some ways it isn’t. Players who refuse to help with Improvements will still benefit from those that their sisters have put in place, and there is no mechanism to punish them for that. However, what deters players from sticking their hands in their pockets instead of helping is that by determining which Improvement cards get purchased, a player can align the 9 territories with her banner virtue, possibly securing big points at the end of the game. Some folks might deride this gameplay element – it complicates the tactical decisions by making them less self-serving and opening up the possibility for one player to benefit from others’ investments. But thematically, it couldn’t fit into Monarch any more perfectly; the race for the crown will not be won at the expense of the people governed, and what benefits one of us will benefit all of us. 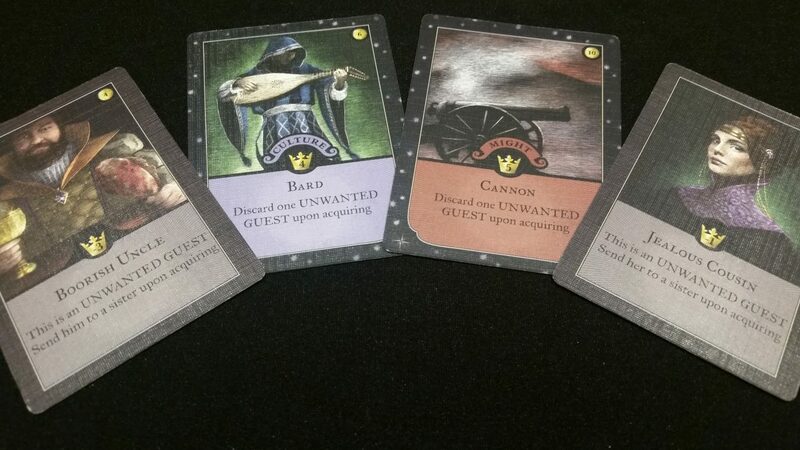 The art is spectacular, but some of the cards in our printing were slightly damaged, and the edges on some cards wore quickly. This could easily be due to our copy being among the first produced, and doesn’t seem to be a systemic issue. Simply sleeving the cards will fix this issue, as well. Some of the iconography could be bigger and more emphasized. Card costs are fairly tiny, and determining whether a card is a Beast or a Garment is dependent on noticing the fairly subtle watermark behind the card’s text. Everywhere, the game is easy to look at but tough on the eyes, if you take our meaning. 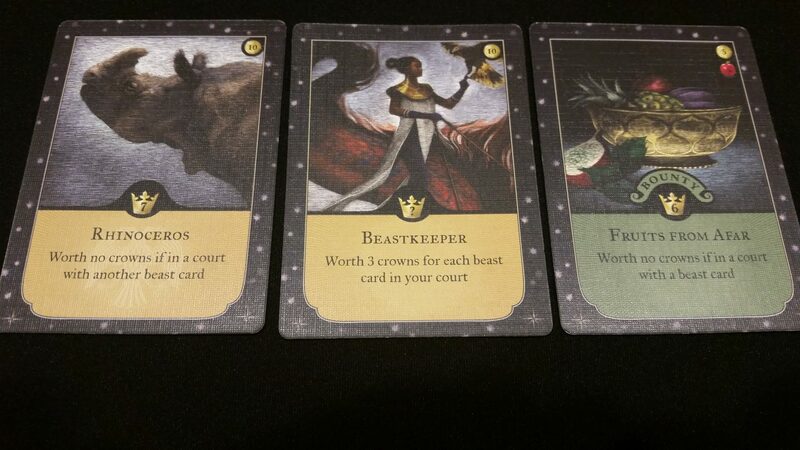 Jess: Monarch is a beautiful game in so many ways. The art is fantastic (our photos don’t quite capture the beauty of the scratch-art style), the cadence is clean and enjoyable, and the engine-building is really fun and engaging. Andrew: And it is somehow all those things without being fussy or overly-complex, and all the while being a genuinely enjoyable experience. Somehow both collaborative and competitive, Monarch is a rare breed of game indeed. Now, this particular experience won’t be for everyone, granted. There are some, as mentioned, who will find the tactical depth a little light and the whole ‘shared engine’ thing to be troubling, but we say embrace Monarch for what it is and you will have a really fun, unique gaming experience. Andrew: Oh, and I suppose there may be some who will be off-put by the clear design choice to place the players exclusively into the roles of powerful women; to anyone who finds that troubling, well, build a bridge and get over it. You can grab a copy of the excellent Monarch from the link below. And just in time for Gen Con, it sounds like there might be an expansion in the works – we’ll definitely report back whatever we learn there!